Click your heels together and get ready to follow a yellow brick road full of fun, adventure and wacky characters. 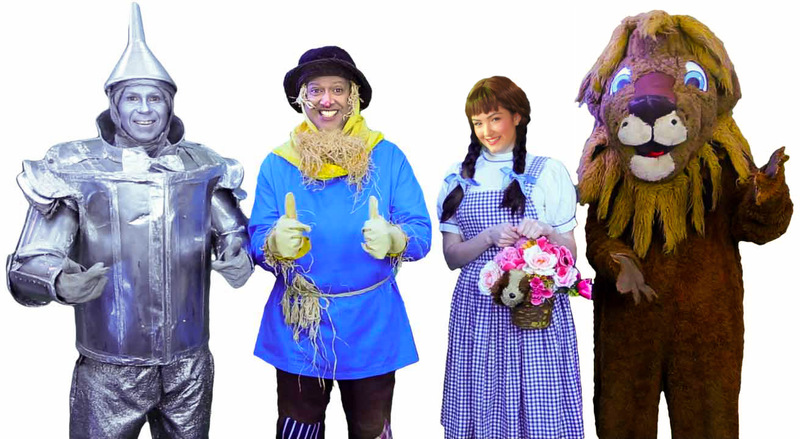 Go off to see the wizard with Shakey the Scarecrow, Shiney the Tinman, Scarey the Lion & Dorothy in this new, fun re-telling of Frank Baum’s classic story produced by Youngstars2.com. Share a journey that goes far beyond being one of Australia’s top kids interactive shows with striking community initiatives, Oz festivals and our very own Oz-themed children’s centre in Sydney’s Macarthur region. Back home in Sydney during the July school holidays. Exciting interactive fun for Christmas. More..
Honoured to interact with the original Munchkins from the 1939 MGM classic film. Ollie the Optometrist was thrilled by Australian Foreign Minister Julie Bishop’s announcement that benefits 10,000 underprivileged children of the India Vision Institute’s projects. Successful community festival in Campbelltown on the Weekend Saturday Show, benefits the 24 Hour Fight Against Cancer Macarthur.